court. Kilmington is very fortunate to have this wonderful facility. 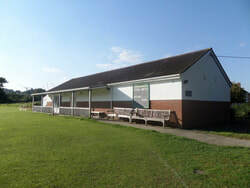 In 2006 a new pavilion was constructed which incorporates all modern day requirements, a club room which is available for hire, a kitchen, changing facilities for sport and a garage to house equipment for maintaining the field and its surrounds. A feature of the playing fields is the very fine Monterey Pine, which is jealously guarded by the community and is close to being 100 years old. The cost of hiring the Pavilion is £8.00 for the first hour and £5.00 for subsequent hours. Special daily rates are available. ​For bookings and special rates please email p.huscroft016@btinternet.com or phone 01297 32243. How did Kilmington obtain such fine facilities? 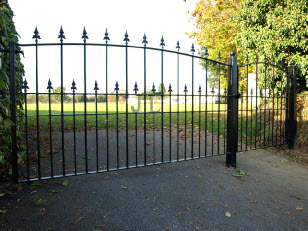 The Kilmington Playing Fields are a registered charity, so preserved for the future, as the result of a benefactor in the early part of the 20th Century. Records show that cricket was played in the village well prior to 1900 but during the 1900/1910 period an Arthur Hitchcock arrived in Kilmington to build himself a fine house which still stands today. He was a very philanthropic Victorian gentleman of some wealth and, together with his wife, was very involved with the local community. They were involved in many organisations including gardening and nursing however it would appear his particular interest was in cricket and bowls. Through the early part of the 20th Century he promoted the cricket team, developed the bowls club and, prior to 1910, constructed a wooden cricket pavilion. Despite much character the pavilion was rebuilt in 2006 as it had become outdated. Arthur Hitchcock was also involved in the construction of the Church rooms which were once opposite the village hall. There seems little doubt that he planted the Monterey Pine and it is hoped that this tree can be maintained for many years as a fantastic memorial to our benefactor. 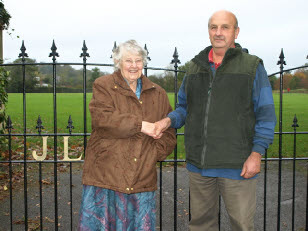 New gates were donated to the Hitchcock Playing Fields by May Lavender in memory of her husband, Jack, who did so much for Kilmington Cricket Club. 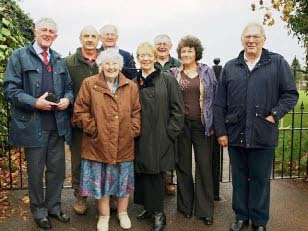 These photographs show May Lavender with her family and Michael Collier and Chris Bolton, Chairman and Deputy Chairman of the Parish Council.